In her remarkable true story about an extraordinary pony that has been published by Forelock Books, Lady Elizabeth Kitson has recounted the wonderful tale of Legend with whom she won at the Royal International Horse Show three years running from 1946 to 1948, and at the first Horse of The Year Show in 1949. 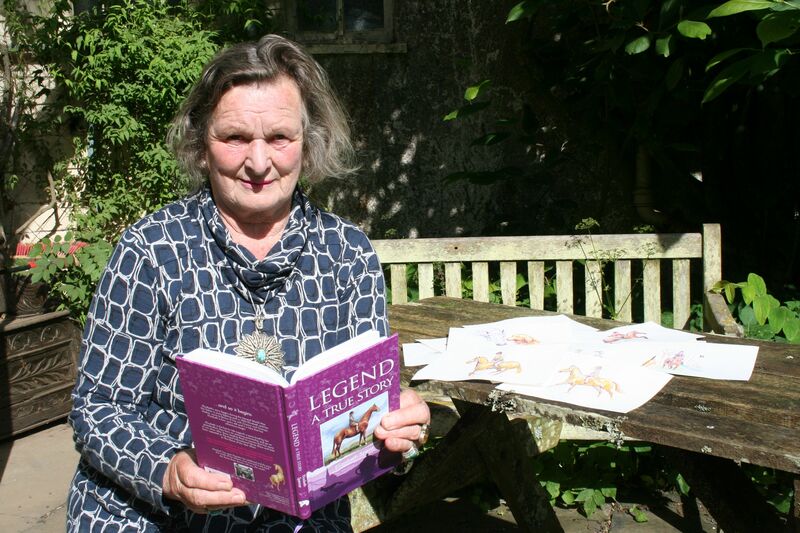 Lady Elizabeth, who is 77 and lives on the edge of Dartmoor in Devon, decided to write the beguiling story of the most famous show pony ever as a legacy for her grandchildren, and in her book she recounts life as a young girl, during and after the war. She tells of what it was like growing up in the English countryside, of family life, of different communities, of a time where horses travelled up to London by train and of the magical impact they had on the showing world. A renowned artist, Elizabeth has illustrated the book with her own paintings and she tells her story through both her own and Legend’s eyes giving a touching and amusing insight into the human world from a horse’s point of view. Elizabeth’s story begins in Surrey during the Second World War. Her father is away fighting and in 1943 Elizabeth and her mother move to Devon to live with Granny and Gramps. Elizabeth is four years old and it is here that her adventures begin. Life on Dartmoor during the war is hard but full of possibilities for this young girl. Not yet five, she is the first to ride Legend. After numerous falls, they finally become a team that goes on to win show after show, leading them to the most prestigious show of the time and to success that has never been repeated. Elizabeth is renowned in Devon and beyond. After her early success on Legend, she went on to become a formidable horsewoman. Inspired by great riders such as Harry Llewellyn, Ted Edgar and Pat Smythe, she showjumped, competing internationally and schooling novices up to Grade A, while also enjoying many successes in point-to-points. She rode and schooled ponies for showing, hunter trials and hunting, judging classes across Britain and internationally. In 1962 she married the then Major Kitson, which meant she had to turn down an invitation to ride on a British showjumping team, and became committed to the life of an army wife during which time she founded the Army Families Federation. Since her husband’s retirement 31 years ago, their home has been on Dartmoor where her father Colonel Spencer’s grandmother lived. She has been a deputy lieutenant of Devon since 2002, and has sat on many other boards and committees including the Dartmoor Preservation Society, of which she is vice president. In the Queen’s 2015 Birthday Honours List she was awarded an OBE for services to the Army Families Federation and to the community in Dartmoor, Devon. Despite an eclectic and exciting life, her memories of Legend remain her most precious. For adults her story offers a nostalgic reminder of life of yesteryear, during the War and after. For children it is a beautiful and inspirational story of a childhood where ponies and riding played the central role and is a heart lifting account of the most famous show pony ever.